The Dwarven city of Arkngthamz-Phng rivaled the splendor of Dumac's kingdom before it was laid to waste by a Dragon in the First Era. The legend of that terrifying creature has long kept travelers far from Fang Lair ... until now. Fang Lair is a group dungeon in Bangkorai. 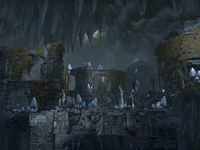 It is part of the Dragon Bones dungeon pack DLC, along with Scalecaller Peak. The entrance is located in northeastern Bangkorai. 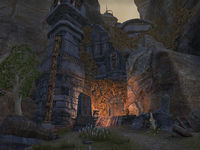 The dungeon itself is located in an ancient Dwemer ruin site, where necromancers are attempting to resurrect a once-living Dragon. Notes on the Dwemer ruin, written by Neramo, can be found near the entrance to the dungeon. Casting the Bones: Investigate a necromancer cult searching for a long-dead Dragon. Pledge: Fang Lair: Prove you are truly Undaunted by clearing Fang Lair. 5 items: When you cast an ability while under 33% Stamina, you restore 104-9000 Stamina. This effect can occur once every 1 minute. 5 items: Increases the Magicka or Stamina your Heavy Attacks restore by 30%. 2 items: When you take damage from a nearby enemy, you summon a growing pool of desecrated bile for 8 seconds. Enemies in the bile take 5-430 Disease damage every 1 second and are afflicted with Minor Maim and Minor Defile for 4 seconds, reducing their damage done by 15% and healing received and Health Recovery by 15%. This effect can occur every 8 seconds. 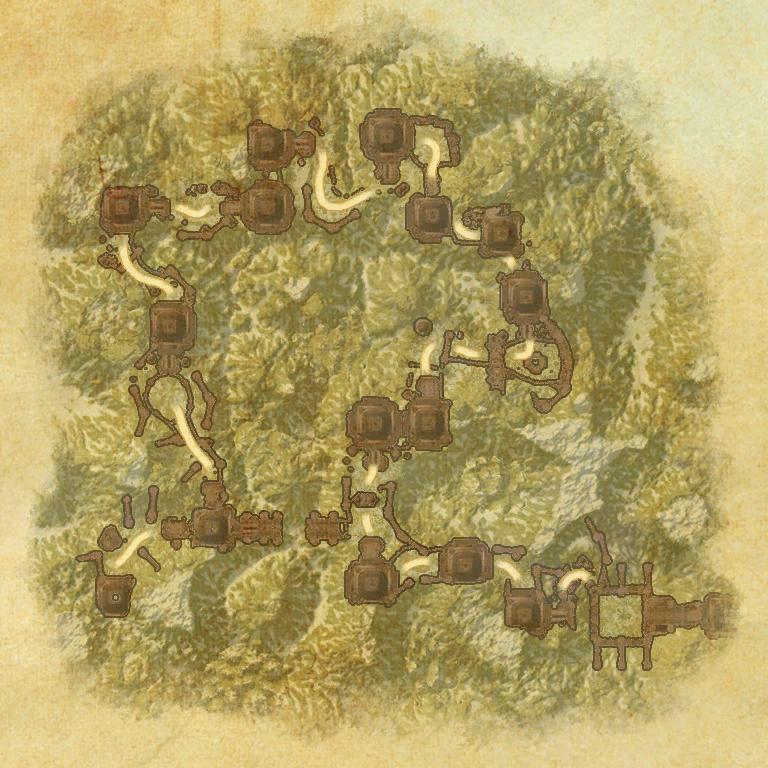 Dragon Bones Explorer 5 Enter either Fang Lair or Scalecaller Peak for the first time. Fang Lair Vanquisher 5 Defeat Lizabet Charnis, the Cadaverous Menagerie, Caluurion, Ulfnor and Sabina Cedus, and Orryn the Black and Thurvokun in Fang Lair. Horrific Halitosis 10 When hit by Thurvokun's Plague Breath in Fang Lair, be under the protection of Yisareh's Life Ward while standing in direct contact with three other party members who also have Yisareh's Life Ward. ​ Fang Lair Style Master 50 Learn every chapter in the Fang Lair Style book, occasionally found as rewards for completing the Fang Lair dungeon. Dragon Bones Delver 50 Complete Veteran Fang Lair and Veteran Scalecaller Peak. Fang Lair Challenger 50 Complete the listed achievements for Veteran Fang Lair. Fang Lair Conqueror 5 Defeat Lizabet Charnis, The Cadaverous Menagerie, Caluurion, Ulfnor and Sabina Cedus, and Orryn the Black] and Thurvokun in Veteran Fang Lair. Not a Statistic 50 Defeat Lizabet Charnis, the Cadaverous Menagerie, Caluurion, Ulfnor and Sabina Cedus, and Orryn the Black and Thurvokun and all of their minions in Veteran Fang Lair, without suffering a group member death. The Quick and the Dead 50 Defeat all encounters in addition to Lizabet Charnis, the Cadaverous Menagerie, Caluurion, Ulfnor and Sabina Cedus and Orryn the Black and Thurvokun in Veteran Fang Lair in under 30 minutes. Timer starts upon engaging the first group of Blackmarrow necromancers. Let Bygones Be Bygones 50 Defeat Orryn the Black and Thurvokun after reading the incantation in Orryn's Notes in Veteran Fang Lair. Leave No Bone Unbroken 50 Defeat all encounters in addition to Lizabet Charnis, the Cadaverous Menagerie, Caluurion, Ulfnor and Sabina Cedus, and Orryn the Black and Thurvokun in Hard Mode Veteran Fang Lair in under 30 minutes without suffering a party member death. Veteran Necromancer Slayer 10 Defeat 350 Blackmarrow Necromancers in Veteran Fang Lair. Veteran Skeleton Slayer 10 Defeat 500 Skeletons in Veteran Fang Lair. Fungi Free 10 Defeat the Cadaverous Menagerie without anyone in your group taking damage from Volatile Fungi in Veteran Fang Lair. Minimal Animosity 10 Defeat Orryn the Black and Thurvokun while only destroying a maximum of one Animus Crystal before Orryn merges with Thurvokun in Veteran Fang Lair. Starved Scarabs 10 Defeat Orryn the Black and Thurvokun without any party members being hit by a Giant Scarab's Degenerative Acid in Veteran Fang Lair. Cold Pursuit 10 After reciting the incantations in Orryn's Notes, defeat Orryn the Black and Thurvokun without any party members being hit by Orryn's Wraith Thralls in Veteran Fang Lair. Elementary Anatomy 10 Deactivate each of Caluurion's Relics using elemental Bonefiends in Veteran Fang Lair. Nonplussed 10 Defeat Ulfnor and Sabina Cedus without a party member being affected by Sabina Cedus's Haunting Spectre in Veteran Fang Lair. Obedience Maiming 10 Defeat the Cadaverous Menagerie without a party member being killed by the Cadaverous Senche-Tiger's Death Grip in Veteran Fang Lair. Fang Lair also appears in Arena, where it is the location of a piece of the Staff of Chaos. This page was last modified on 2 March 2019, at 22:34.